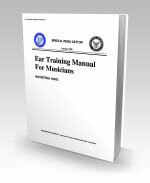 10243.pdf - Pages: 94 - 10243 Ear Training Manual for Musicians - Covers the divided beat in simple time and compound time; major triad and minor triad in numeral notation and staff notation; the subdivided beat in simple time and compound time; major and minor scale activities; syncopation involving beat and divided beat; diatonic and nondiatonic melodies; time beating patterns; counting system; and performance procedures and guidelines. 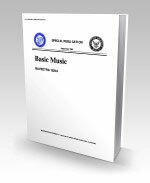 10244.pdf - Pages: 242 - 10244 Basic Music - Covers basic principles of music and musical instruments. 12012.pdf - Pages: 112 - 12012 Harmony - Discusses use and formation of harmony. 12013.pdf - Pages: 64 - 12013 Basic Music (Navy) - Contains information on media, form, and conducting as it relates to Navy musician. Supplement to BASIC MUSIC, NAVEDTRA 10244.